Most sellers are very familiar with Open Account (O/A) and Letter of Credit (L/C) transactions. In the international arena, open account sales are regarded as having the most risk; letter of credit transactions as having the least. 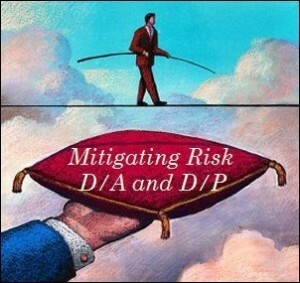 Between these two poles, however, are two lesser-known transaction types: Documents Against Payment (D/P) and Documents Against Acceptance (D/A).These represent risk levels lower than an O/A, but greater than an L/C. Both rely on an instrument widely used in international trade called a bill of exchange or draft. A bill of exchange, or draft, is a negotiable instrument that is both drawn up by and made payable to the exporter/seller. Although written by the seller, it has the equivalent effect of a check written by the buyer. Drawer – the party issuing the bill of exchange; usually the exporter/seller. Drawee – the recipient of the bill of exchange for payment or acceptance; usually the buyer. Payee – the party to whom the bill is payable; usually the seller’s bank. Bills of exchange are either payable at sight (sight drafts) where the bank pays the full amount upon presentation, or payable at some future date (time or term drafts). 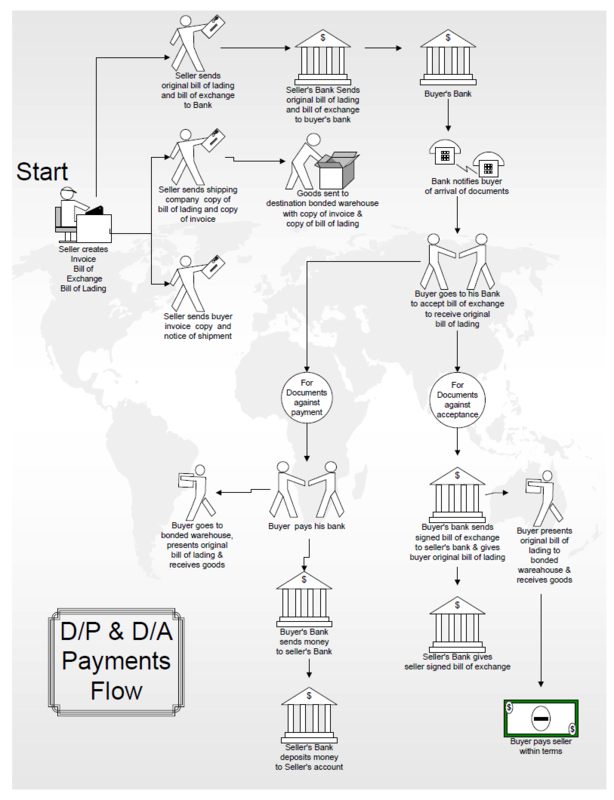 Here’s how they work with Documents Against Payment (D/P) and Documents Against Acceptance (D/A) transactions. The D/P transaction utilizes a sight draft. Payment is on demand. After the goods are shipped, the exporter sends the sight draft to the clearing bank, along with documents necessary for the importer/buyer to obtain the goods from customs. The buyer has to settle the payment with the bank before the documents are released and he can take delivery of the goods. If the buyer fails or refuses to pay, the exporter has the right to recover the goods and resell them. On the surface, D/P transactions seem fairly safe from the seller’s perspective. However, in practice there are risks involved. The buyer can refuse to honor payment on any grounds. When the goods are shipped long distances, say from Hong Kong to the United States, it is usually impractical and too expensive for the seller to ship them back home. Thus, the seller is forced to sell the goods in the original country of destination at what is usually a heavy discount. In cases of shipments by air freight, it is possible that the buyer will actually receive the goods before going to the bank and paying for them. D/A transaction utilize a term or time draft. In this case, the documents required to take possession of the goods are released by the clearing bank only after the buyer accepts a time draft drawn upon him. In essence, this is a deferred payment or credit arrangement. The buyer’s assent is referred to as a trade acceptance. As with a D/P, the importer can refuse to accept the goods for any reason, even if they are in good condition. The buyer can default on the payment of a trade acceptance. Unless it has been guaranteed by the clearing bank, the seller will need to institute collection procedures and/or legal action. Despite the risks listed above, utilizing D/P and D/A transactions does have a number of advantages for the seller. The bill of exchange facilitates the granting of trade credit to a buyer. It can provide the seller access to financing. The bill of exchange is formal, documentary evidence, acceptable in most courts, confirming that the demand for payment (or acceptance) has been made to the buyer. It is possible for the seller to dispute an unpaid/unaccepted (called dishonored) bill of exchange, sue the buyer, and potentially receive payment. The seller disputes a dishonored bill of exchange via a formal, usually two-step process. Step #1 Noting: A bill of exchange is noted in order to obtain official evidence that it has been dishonored. A Notary Public presents the bill/draft to the drawee (buyer) for acceptance or payment and notes on the bill the reason given for dishonor. Noting is often followed by a formal protest. Step #2 Protesting: The Notary Public produces a formal deed of protest bearing his seal. This document provides formal evidence of the presentation of the bill to the drawee and the reason for the dishonor. The protest is accepted by most courts in the world as evidence that the bill has been dishonored. Should the buyer fraudulently obtain possession of the documents, or the goods, without paying or accepting the bill of exchange, it is possible to seek satisfaction from the clearing bank or the customs warehouse. Consider the following hypothetical case. China Fireworks Co. sold a container load of fireworks to U.S. Fireworks on D/P terms. The exporter prepared the paperwork for the transaction, including an original Bill of Lading (B/L), a Bill of Exchange (in this case, sight draft), and an original invoice. The Bill of Exchange would be payable through the exporter’s bank and would be drawn on First Commercial Bank (the importer’s bank). The exporter faxed a copy of the Bill of Lading and the invoice to the buyer with confirmation that the goods would be shipped via United Shipping on the freighter Morristown on May 16th. The fireworks were to arrive at the bonded warehouse in New York City on June 15th. The goods were picked up from the exporter by United Shipping. United Shipping’s representative signed and stamped the original bill of lading and returned it to the China Fireworks representative, Mr. Zhang. Mr. Zhang then took the entire package of documents to this bank, where the Documentary Credit’s Clerk personally placed the necessary items, along with explicit instructions on the terms of the transaction, into a courier package. The package was sent to First Commercial Bank in the USA. On June 22nd, a week after the shipment was to have arrived in New York City, China Fireworks contacted their bank to determine if payment had been received. Payment had not been made and the Chinese bank wired First Commercial Bank inquiring about the transaction. Did the buyer accept the bill of exchange? Did the buyer receive the original bill of lading? In the meantime, China Fireworks’ U.S. representative heard that U.S. Fireworks had indeed picked up the goods from the warehouse. In fact, they had already been used in a spectacular July 4th celebration on Coney Island. On November 15th, a full five months after the goods arrived in the U.S., China Fireworks, which had still not received payment or any correspondence from the U.S. bank, placed the account with their lawyer for collection. Counsel immediately attempted contact with U.S. Fireworks. However, the phone number had been disconnected. Further research turned up the fact that U.S. Fireworks had filed Chapter 7 and was now out of business. The next call was to United Shipping’s warehouse in New York City, which did, in fact, have a bank-endorsed original bill of lading on file for the transaction. The next logical step was to contact First Commercial, the buyer’s bank. After some research by the documentary collections clerk, counsel found that the bank’s file did still contain the bill of exchange, which had not been signed by the buyer. The clerk also informed the collector that the bank had foreclosed on the buyer’s account to recoup their security interest. Therefore, there would be no payment for the fireworks. A notarized and legalized affidavit from Mr. Zhang of China Fireworks attesting to the documents he prepared. Assurance from both China Fireworks and the Chinese bank that the two gentlemen involved would, if necessary, appear as witnesses at trial. First Commercial Bank, not surprisingly, mounted strong opposition to the case. Ultimately, it went to trial, the two Chinese gentlemen had to fly to the U.S. to testify, testimony of expert witnesses on both sides was taken, and considerable money was expended on both sides. Needless to say, China Fireworks was pleased with the outcome. 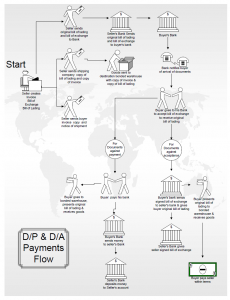 When documented fully and correctly, D/A and D/P transactions provide a means for exporters to extend some level of credit facilities to their customers, while at the same time protecting their legal rights to payment. Most countries have adopted codified laws on Bills of Exchange following, in general, those set forth in the League of Nations’ Geneva Conventions (1930). The United Kingdom Bills of Exchange Act 1882 is the basis for rules governing Bills of Exchange in Ireland, U.K. and Commonwealth countries that were part of the British Empire. In the United States, Article 3 of the Uniform Commercial Code governs the issuance, transfer and enforcement of negotiable instruments including bills of exchange. The United Nations Commission on International Trade Law (UNCITRAL) has designed a Convention to harmonize the various country laws. This Convention, called the United Nations Convention on International Bills of Exchange and International Promissory Notes, was adopted and opened for signature by the UN General Assembly in 1988. It has not yet received the 10 signatures required for ratification. This Convention only applies if the parties use a particular form of a negotiable instrument indicating that the instrument is subject to the UNCITRAL Convention. Dave Greenberg began his career in commercial collections with Dun and Bradstreet in Seattle, Washington. After spending 8 years with D&B, Dave took a position with ABC-Amega Inc. Over a 32-year span, he vastly expanded their international department and became an industry leader in the commercial-international niche sector. He was a Past President of the California Commercial Collectors Association, on the panel of commercial arbitrators for the American Arbitration Association, and the Council of Better Business Bureaus, while also remaining active in the US Air Force Reserve.